The US dollar recovered somewhat after sharp falls at the end of last week. The greenback pushed higher against the British pound and the euro both of which were suffering on weak fundamentals. USD/JPY also rallied upwards as risk appetite improved and the yen saw an outflow of funds. Friday’s dismal jobs data took everyone by surprise. The economy only added 142,000 jobs last month. This was far below the 200,000 that most economists had predicted. A single “weak” month could have been seen as a one off. But with new hires for July and August also being revised sharply lower (by 59,000), this latest data could signify the US economy is stalling or at best entering a soft patch. Reasons for this are abound but most likely the uncertainty around the timing of interest rate rises as well as crimped demand in Asia are causing business to heed caution. Stock markets around the globe rallied today as traders bet that the Federal Reserve will now delay its first rate rise in nearly a decade until early December or early next year. Fed fund futures were indicating only a seven percent chance of a rise in October, and a thirty three percent chance of a rise in December. Traders also had to grapple with a data indicating the US services sector is slowing. Markit’s purchasing managers’ index, a closely watched barometer of the health of the sector, dropped to 55.1. Only missing forecasts by 0.6 points it was still enough to unnerve markets. Acting as a counterbalance however was the fact that the Eurozone and the UK are also experiencing the economic chill. Germany’s services industries recorded a slowdown last month. Meanwhile the service sector across the Eurozone fell to 53.7 in September from 54 the previous month. 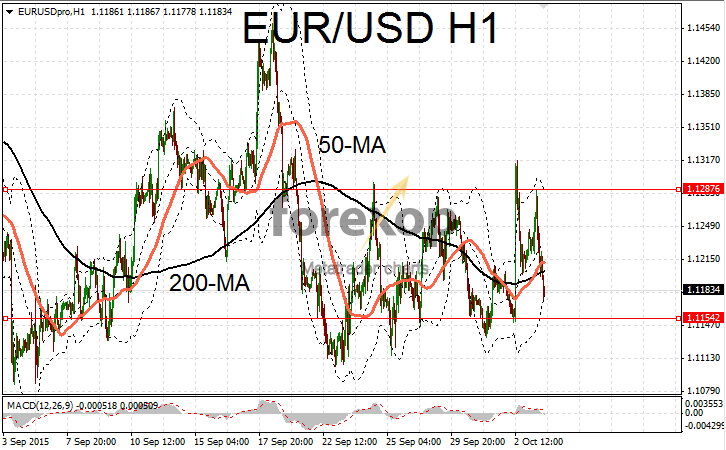 After a buoyant start EUR/USD sold off on the weak data and sank back below support at 1.12. Today’s move erased most of the gains put on after Friday’s nonfarm payrolls. 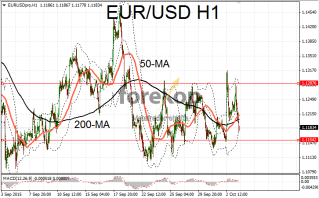 EUR/USD continues to trade within a “choppy sideways channel”. Momentum on the four-hour chart is still pointing upwards yet uncertainty around interest timing and any further ECB stimulus is preventing any clear direction from emerging.